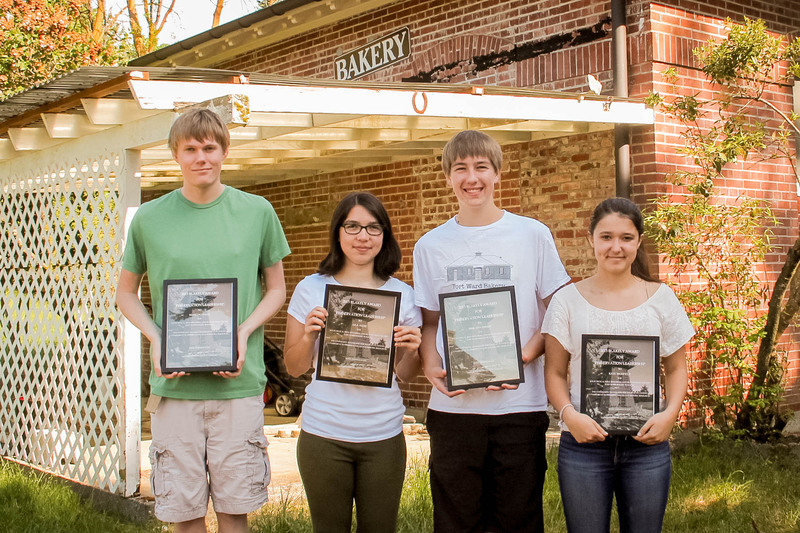 The Fort Ward Youth Advisory Committee are recipients of 2015 Blakely Preservation Leaders Award for their work to restore the 1910 Fort Ward bakery building. Bainbridge High School students Aila Ikuse, Kate Merifield, Mark Dettman and Erik Appleberry were recently honored at a Bainbridge Island City Council meeting. “They have shown remarkable poise and persuasive ability in presenting their project before the public and demonstrated awareness of and dedication to preservation of the history and historical environment of their community,” said William Shopes, of the Bainbridge Island Historical Society, who nominated the youths. The Blakely Awards are given annually by the Bainbridge Historic Preservation Commission to recognize significant contributions toward historic preservation in the community. In leading the Fort Ward Community Hall project, the youths have made presentations on the project to numerous community groups and gatherings including Bainbridge Rotary. They have also given educational presentations to students from Wilkes and Blakely Elementary schools. Read all about the award in a feature story in the Bainbridge Island Review newspaper’s online edition.